West Hampstead Life | ‘ello ‘ello What’s going on here? The saga of the local police stations has dragged on a while but we do at last have some clarity now that the Local Policing Model has been finalised. It came into effect last week. There’s been much publicity over the closure of Hampstead police station but less clarity over what was happening this side of the Finchley Road. The answer is that West Hampstead police station (that’s the one on Fortune Green Road) will remain open as a deployment centre and the police horses will be staying. The much-talked about “contact points” for our area will be at the police station (this is a change from what was expected) and at the Safer Neighbourhoods Base on West End Lane opposite the junction with Broadhurst Gardens. They will be open Wednesday and Thursday evenings from 7-8pm and Saturday afternoons from 2-3pm. These hours will be the same for all contact centres across London apparently! These contact points are “for non-urgent face-to-face contact, where the public can meet their local police at regular known times.” We should feel pretty special to have two contact points so close together. 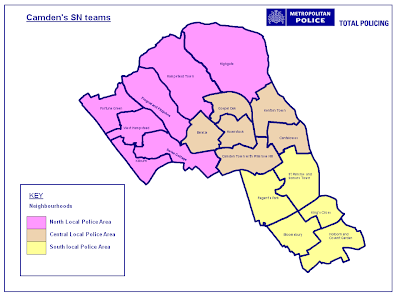 Across Camden, there are only three others – one of which is at the Swiss Cottage SNT base near the tube station. Camden will have two (yes, just two) full-time front counters: Kentish Town police station will be open 24 hours a day, while Holborn will be open 8am-8pm weekdays and 10am-6pm on Saturday. Crimefighting takes a rest on Sunday. Over the border in Brent, Kilburn police station (that’s the one in Queen’s Park) will have a full-time front counter and Walm Lane in Willesden Green will be a contact point. Back to Camden – the borough has been divided into three “neighbourhoods”: North, Central and South. Big neighbourhoods.Each Neighbourhood will also have an “appointment car”, with 30 slots available every day of the week. It’s not clear how these will work. In terms of police numbers, each neighbourhood is headed by an inspector. In our case (we’re “North”) that’s Nikki Babb. West Hampstead & Fortune Green wards will share a sergeant, as they have for some time. 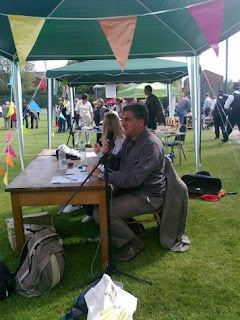 Right now, that’s Ian Hutton. Then each ward has a dedicated PC and PCSO. 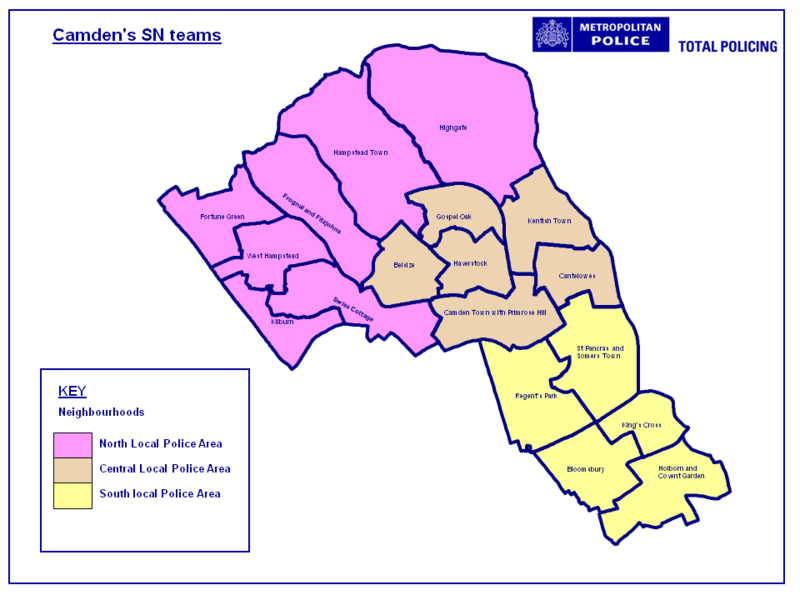 There are an additional five teams of seven officers, each lead by one sergeant, who will be deployed across the seven wards that comprise the North “neighbourhood”.